Eliminating malaria requires beating artemisinin resistance. But it’s running out of time. A nurse registers patients who have been waiting to make a doctors appointment outside the free Thukha Charity Clinic in Yangon, Myanmar, on Feb. 11, 2013. WANG PHA, Thailand—Dr. 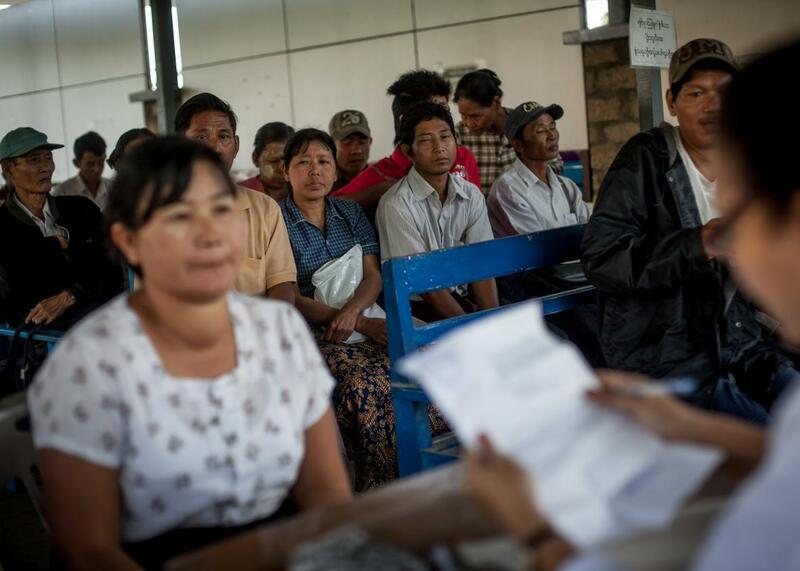 Aung Pyae Phyo hasn’t seen a malaria case in five days. That’s not so unusual anymore at the clinic he runs in this small town just on the Thai side of the border with Myanmar, also known as Burma. “When we opened the clinic in 2003, more than 90 percent of the patients coming to the clinic were malaria,” he recalls. At that time, malaria was the leading cause of death in this area, which is heavily populated by migrants and refugees from the Karen ethnic group who are fleeing ethnic conflict across the border. Today, only about 1 or 2 percent of the patients at a clinic set up specifically to combat malaria have the disease, allowing Aung Pyae Phyo’s team to provide routine medical care and maternity services to the mostly Burmese patients who cross the narrow river separating the two countries. The situation mirrors what’s happening worldwide. The World Health Organization reported in December that global malaria deaths fell from 839,000 in 2000 to 438,000 in 2015. Around 200 million people per year still contract the disease, and many of those who die are children. But the once audacious goal, laid out by the United Nations and the Gates Foundation, of entirely eliminating one of the leading killers in human history by 2040 now seems ambitious but not unreasonable. The good news is especially evident in Southeast Asia. The Greater Mekong Subregion, which includes Cambodia, Laos, Myanmar, Thailand, Vietnam, and China’s Yunnan province, saw an 81 percent decrease in malaria deaths between 1998 and 2010. At a summit in Myanmar in 2014, the assembled governments set a goal of completely eliminating malaria in the Asia-Pacific region by 2030. The region is not the worst effected by malaria. Ninety percent of all malaria deaths occur in sub-Saharan Africa. But Southeast Asia may be where this long-running battle between human and parasite is ultimately won or lost. Artemisinin has revolutionized the treatment of malaria. It was developed by Chinese scientists to treat North Vietnamese soldiers during the Vietnam War. One of the researchers, Youyou Tu, was recognized with this year’s Nobel Prize for Medicine. Artemisinin can wipe out malaria quickly, with few side effects, and is extremely simple to administer, requiring just three doses over three days. Unfortunately, it’s not working as well as it used to. Resistance to artemisinin was first observed in western Cambodia around 2006 and has now spread throughout the greater Mekong subregion. Aung Pyae Phyo estimates that 85 percent of the malaria cases he sees at Wang Pha now show some level of artemisinin resistance, meaning treatment takes longer and longer and is gradually becoming less effective. The spread of resistance to India and beyond is probably inevitable if malaria isn’t wiped out soon. Resistance occurs when the Plasmodium parasite that causes malaria collects genetic mutations that allow it to withstand the drug. The resistant parasites quickly outnumber those that are still susceptible to the drug, and then spread rapidly through mosquitoes, the vectors for the disease. Artemisinin appears to be following a curious historical pattern. For reasons researchers still don’t have a satisfying explanation for, resistance to anti-malaria drugs has repeatedly emerged first in western Cambodia before spreading elsewhere. In the 1950s, resistance to chloroquine began in Cambodia. In the 1960s, it happened again with a drug called fansidar. In each case, resistance to the drug has spread worldwide, most disastrously to Africa. Neither drug is still widely used. “The parasites are evolving and one day they will re-emerge. We have seen it in the past and there’s no reason to believe that the future will be different.” says Francois Nosten, director of the Shoklo Malaria Research Unit, based in Maeo Sot, Thailand, which runs a network of clinics on both sides of the Thailand-Myanmar border, including Wang Pha. The spread of the two previous waves of resistance to Africa caused millions of deaths, says Nosten, who notes, “Our concern is that again, history is repeating itself. As long as we don’t eliminate the last parasite we won’t eliminate malaria. We are in a race against the parasite.” In Nosten’s view, the 2030 regional target isn’t too ambitious, it’s far too slow. By that time, the decades of progress in fighting malaria will already be lost. Only one human disease—smallpox—has ever been successfully eradicated, though polio and Guinea worm are getting close. The eradication of malaria is theoretically possible, but the last mile of this race is likely to be the toughest, in large part because of the speed of drug resistance. To combat resistance, artemisinin is almost never administered as a solo therapy but in combination with other drugs. These combination therapies can be tweaked as they lose their effectiveness. “What’s happening in Cambodia is this race to stay ahead. You’re using different drugs in different parts of the country and constantly switching to stay ahead of the resistance,” says Henri Allen, a malaria technical adviser for Population Services International in Cambodia. Another obstacle is the prevalence of “healthy carriers,” patients who carry trace amounts of the malaria parasite but don’t show symptoms and therefore aren’t treated for the disease. If bitten by mosquitoes, these carriers can transfer the disease parasite to others. For the moment, the region is relatively peaceful, with some notable exceptions, such as the ongoing violence between the Myanmar government and the Muslim Rohingya minority in western Rakhine state. Thailand’s recent military coup has left the anti-malaria agenda largely unaffected, according to Thai officials, but future instability could undermine efforts. There’s also a concern that as the number of cases goes down, attention devoted to the disease will dissipate. While the efforts of the Gates Foundation; government programs like the U.S. President’s Malaria Initiative, launched under the George W. Bush administration; and international financing programs like Global Fund to Fight AIDS, Tuberculosis, and Malaria have helped focus attention and resources on the disease, governments of countries where malaria is endemic worry that it will be harder to attract international support as the impact of malaria becomes less evident. Despite the looming challenges, there’s still optimism on the ground. From his small wooden home in a village on the Memot Rubber Plantation in Eastern Cambodia, not far from the border with Vietnam, Leang Phal has provided health services for his fellow workers since 1981, in recent years using medicines, equipment, and training provided by Population Services Khmer. Local health workers, without formal medical training but with the instruction needed to conduct tests and administer therapies, is likely to be crucial in eliminating the last pockets of malaria, far from major towns and cities. Research for this article was conducted on a reporting trip co-sponsored by the International Center for Journalists and Malaria No More.